The gallant stag swam stoutly o’er. 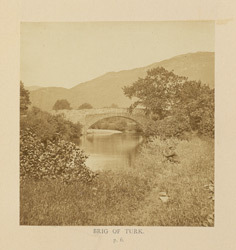 This view of a bridge over a river at Brig o’ Turk in Stirling, Scotland, is one of 13 landscapes photographs by Thomas Ogle illustrating an 1863 edition of Sir Walter Scott’s long narrative poem ‘The Lady of the Lake’. It accompanies a passage from the opening verses describing a dramatic stag hunt through the wild Scottish glens of the Trossachs. At Brig o’ Turk, a lone horseman is left in pursuit of the stag. Known only as ‘The Hunter’, but later revealed as the King of Scotland, James V, in secret disguise, the horseman loses his way in the forest after the stag’s escape. Sir Walter Scott (1771-1832) was the author of immensely popular historical novels and poetry. Their combination of history, chivalry and romance was especially beloved by readers of the Victorian era. ‘The Lady of the Lake’ (1810) was the third of his epic narrative poems inspired by the landscape and legends of Scotland. It tells the story of Ellen Douglas, the beautiful daughter of James Douglas, an outlawed Scottish clan chief, and the uprising of Clan Alpine against the King of Scotland, James V, led by Roderick Dhu, a rebel Highland chief. The story is set in and around the mountains, glens, lakes, and forests of Loch Katrine and the Trossachs, and the great success of the poem made the area a fashionable destination for 19th-century sightseers.